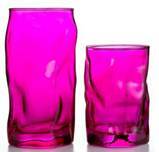 Be sure to check out the beautiful fall glassware available from Bormioli Rocco. An Italian glassware company that is offering some really gorgeous glasses for your fall table. Whether a family get together or an autumn party be sure to check out what they have available this season. Now, wouldn't either one of these glasses look beautiful on your table? I really like mine. They are quite well made. Now to decide if I should purchase more or not! Decisions, decisions! Disclosure: I received no monetary compensation for this post. I did receive Bormioli Rocco glasses for review purposes. All thoughts and opinions are mine. I love the cobalt blue glass.. it somewhat reminds me of depression glass. Very pretty! Easy way to add a burst of color to the table.